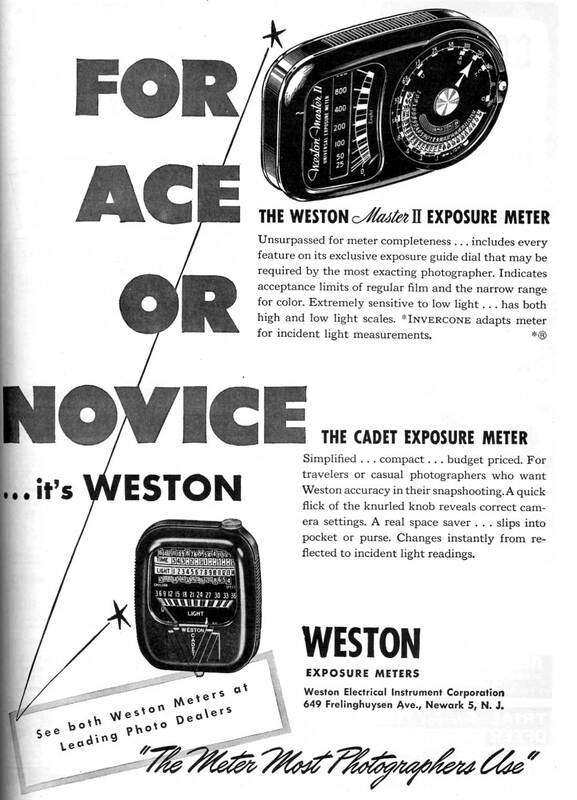 This is freshening of the Weston "Junior" from before the war. It's a shade smaller in length and width, a little bit thinner, and has rounded edges and a smoother lines. In front, the face has been replaced with white-on-black (echoing its Master II brother) and the logo is redesigned a bit. Functinonally it's identical: you read the meter needle's positon, which is your Light Value. Let's say it's 24. 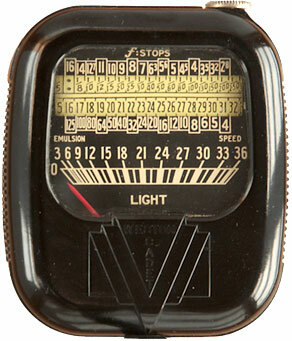 Then you turn the knob on the upper left until the 24 on the bottom half of the ribbon is over your film speed. Let's say we're using something rated 20. The shutter ƒ/stop combinations are read off on the top row (in this case, ƒ/8 at 1/25th, ƒ/5.6 at 1/50th, and so forth. The biggest difference is on the back side (mouse-over the image above). On the Junior, the rear cell is a full disc and that's it. This one has a half-disc, and there's a rotating incident cover (which Weston called an Invercone) built-in. On my example, I have it half-covered. So you could rotate it to completely cover the cell for incident work (better) or uncover it for reflected work. Since the invercone is physically mounted on the meter, you can't lose it the way you could with the Masters. It's a nice feature.